Kathy Bernhardt is a corporate disability consultant and inclusion trainer. As the managing director of Tangram Business Resourcing, Kathy is responsible for the strategic development and implementation of programs to support businesses in building collaborative relationships aimed at achieving their inclusion goals. Kathy’s experience includes over 20 years of successfully establishing corporate and community relationships. 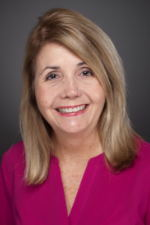 Kathy specializes in building partner relationships on both a state and national level and strengthening connections between a variety of industries and their communities. Most recently, Kathy was the consultant and project leader for a disability inclusion initiative at Sears. In a three year period, Kathy provided over 250 presentations and trainings for retail stores, distribution centers, and call centers across 13 states. Kathy was instrumental in the development of a customer service pre-training class to support recruitment efforts for a call center in Tempe, AZ. Kathy has also worked with Jimmy Jazz, Indianapolis Public Library, Citizens Energy Group, Carrier, and others to increase awareness of inclusive practices in recruiting, hiring, and retention from the disability talent pipeline. Kathy is the chair of the Indianapolis chapter of Disability:IN.